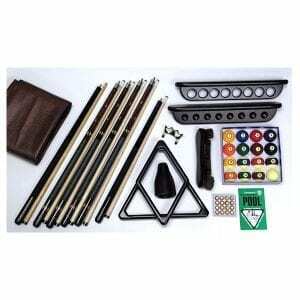 This premier billiard accessory kit features many fine qualities: all the wood finishes on the accessories match, the 58” cues are Premier cues with soft touch grips. 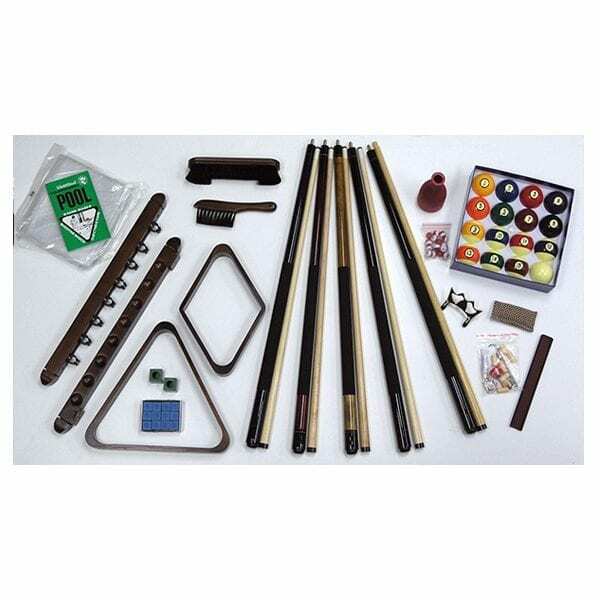 Included in this kit is a rule book, shaker bottle with tally balls, 8’ clear pool table cover, cue tip repair kit, shaft slicker, cue shaper, bridge stick, 4 premier cues, 15 ball rack, 9 ball rack, 2 piece wall cue rack, 9” table brush, and a 7” under rail brush. These accessories can help take your billiard gaming to a whole new level. We also offer you a big selection of chairs, stools, bars, pub tables and many more furniture pieces to complete your game room setup. Some of our chairs rock and swivel to provide comfort while awaiting your turn at the billiard table. Our stools come in either backless or full back styles. And all of our furniture is made from quality wood and faux leather cushions designed to last for years. Get ready for some great billiards fun with all of our game room furniture and accessories.